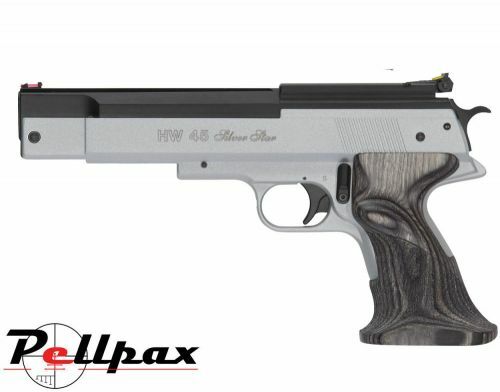 The HW45 is universally regarded as one of the best spring powered pistols that money can buy. Made and designed by Weihrauch for serious shooters, the HW45 is high powered and highly accurate for a truly well rounded performance. The HW45 produces around 5ft/lbs of energy to ensure laser flat trajectories and great power to ensure the ultimate level of control over shot placement. The high power of the HW45 makes it one of the few pistols capable of being an effective vermin hunter control and pest controller but its is also well suited to target shooting. The laminated pistol grips of the HW45 are ambidextrously shaped to ensure easy and accurate operation by shooters of all kinds. The grips are both lighter and stronger than their equivalent in wood and have been stippled for a surer hold, even in wet conditions. This pistol is also fitted with a dovetail rail for the easy attachment of external optics. Please note you will require the specialist 13mm Mounts to fit additional optics to this pistol.